The original recipe called for 2 parsnips, but I couldn't find them so simply replaced them with 100g more potatoes. 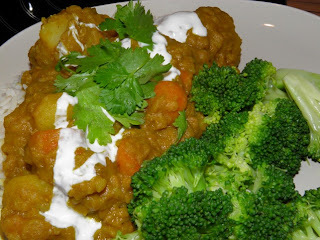 It was a very fragrant (and filling) dish, as the potatoes and lentils absorbed all the flavor. I served it with some plain white rice and steamed broccoli. 1. In a large pan, heat oil on medium heat and cook onion and garlic until fragrant. Tip in potatoes and carrots, and cook on high heat for about 5 minutes. 2. Sprinkle curry powder and pour stock, then bring it to the boil. Reduce heat and add lential. Cover and let it simmer for about 30 minutes until lentils are soft. If it was still too watery, cook without a lid for about 10 minutes, until sauce is thicker. Serve with chopped coriander and yoghurt.